In the following figure I have some distributed data shown but I need to disclose which parameters on the leyend. How it is done? Multiple layouts for data distribution works as expected. Thank you very much, the devil is in the details. new version saves data distribution in the Gantt Chart in project layouts. Yes, it is new functionality and we did not include it in the layouts yet. It looks like the Data Distribution settings are not stored under Layouts. Although easy to change at a click of the mouse it would be convenient if different settings can be stored for different layouts. I plan to use this functionality frequently, it give insight into many details it is very valuable. Perhaps in the same way links can be toggled on/off by clicking on the links icon the same can be implemented for displaying distributed data. I know it is new functionality; you nailed it at the bullseye with this one. Displaying parameters at this place was my first idea but now it is possible to show multiple parameters in the Gannt View and besides distribution of selected two parameters. So we need a lot of space to explain all settings. It could be movable text box that may be shown or not. We'll think about the best way. 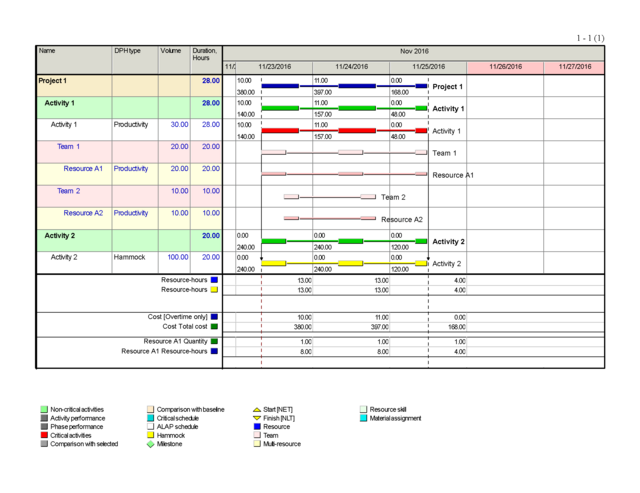 It might also be convenient to display parameters on the Gantt View. For a single layout the idea of using header or footer is good but in the case you are using multiple layouts to show additional time distributed data within the chart instead of using separate table, diagram or report the legend should make it. Yes, Rafael, the legend is absent. And not only for this case because people can also select any field to show in the Gantt Chart instead of activity names but what field was selected is not shown. We will think about the place where the legend shall be inserted and you proposals are welcomed. Of course this information may be entered manually in some footer or header when Gantt Chart is prepared for printing, but this is not sufficient. Why does the Gantt chart move when I edit a link?